This tomato bruschetta recipe is easy, elegant, and eminently impressive when set out for guests. It draws on the perfect proportions of fresh ingredients to create an iconic Italian appetizer. 1. Toss the olives, 1/3 cup (78 ml) oil, basil, tomatoes, salt, and pepper in a bowl. 2. Heat a cast-iron grill pan over medium-high. Brush the slices of bread on both sides with the remaining 3 tablespoons (45 ml) oil. Grill the bread, flipping once, until crisp and slightly charred at the edges, 2 to 3 minutes per side. 3. Transfer the bread to a cutting board and immediately rub one side of each slice with the cut side of the garlic. Top each slice of bread with a scant 2 tablespoons tomato mixture and, if desired, drizzle with oil. Serve immediately. 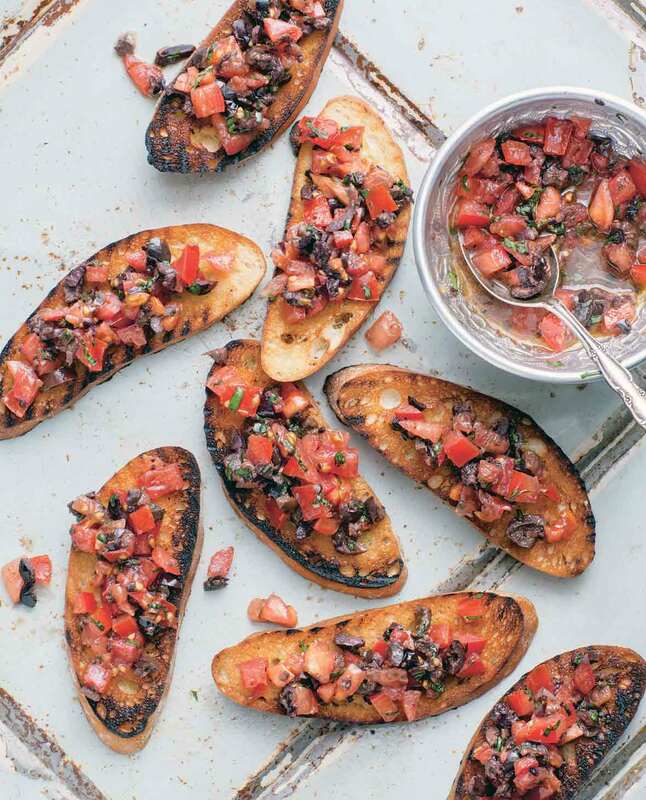 Tomato Bruschetta Recipe © 2015 Saveur. 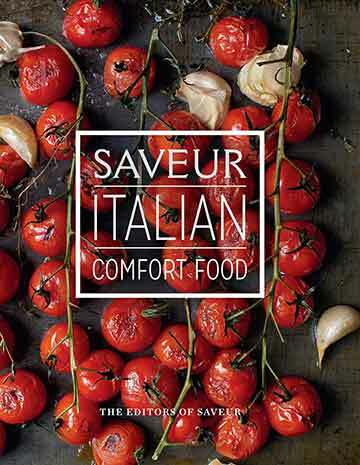 Photo © 2015 Saveur Magazine. All rights reserved. All recipes and photos used with permission of the publisher. I picked up beautiful heirloom tomatoes Saturday morning at the farmers’ market. When life hands you heirloom tomatoes, make tomato bruschetta. Wow, so simple and so delicious! After my first bite, I was only able to get out gleeful noises. I loved my husband’s reaction. He had a bite and stated, “This tastes like summer.” We invited a couple of neighbors over to enjoy this with us. Everyone loved it. I know what I am buying at the farmers’ market this Saturday! I used a cast-iron double burner grill pan. After 3 minutes I needed to turn the bread slices over, and then after 3 more minutes I took them off. This would feed 4 to 6 people, depending on how much self-control they have. This tomato bruschetta is a fast, simple and delicious appetizer! Grilling the sliced bread took about 2 minutes per side in a very hot grill pan. I got 12 nice slices from the ciabatta loaf. I used about 2 tablespoons of the tomato mixture per bread slice. The garlic rubbed on the toasted bread added a nutty and delicious flavor. Depending on the size of the ciabatta loaf, you could make 6 to 8 servings. It really depends on how hungry everyone is! My testers ate 2 slices each. This is a rustic but sophisticated appetizer to serve with a glass of wine. I'll definitely be making it again. What a wonderful way to use those garden-fresh tomatoes. This tomato bruschetta is bright, refreshing, and satisfying in and of itself. It's the perfect summer appetizer or meal along with a side salad. In the past when I have made bruschetta, it has had numerous ingredients accompanied by a good deal of preparation, mostly chopping. Not so with this recipe. Minimal ingredients translate into a clean flavor with very little prep work. The bruschetta was ready within 30 minutes with only 20 minutes of hands-on work. I grilled the bread on our barbecue which gave the bread perfect grill marks and a toasty texture. This is perfect for a summer day when it is too hot to cook. This tomato bruschetta will be a summer staple in my house. What a lovely summertime treat! With heirloom slicing tomatoes and cherry tomatoes coming out of our garden just about every day lately, I was eager to try this tomato bruschetta recipe. I used a mixture of both types of tomatoes (approximately 1 1 /2 pounds) and thought the overall presentation was very nice. The red tomatoes, black olives, and green basil made for a nice color combination on top of the grilled ciabatta slices. (My ciabatta, when sliced into 1/2-inch-thick pieces, made 8 nice sized slices. With the actual charcoal grill ready outside, we grilled the bread this way instead of on the indoor grill pan. I watched the bread carefully and it actually only took about 1 1/2 minutes per side, but it really just depends on the heat source you have going. (I didn't want them to burn, so flipping them at this point was good because the grill was pretty darn hot.) Each grilled bread slice was then topped with about 1/4 cup of the tomato-olive mixture. As a first course we had 8 slices of topped bread to enjoy and the tasty treats were a great accompaniment to a grilled steak and simple side salad. The combination of salty and savory with a touch of acid from the tomato and the hint of garlic makes this tomato bruschetta a winner. The liquids in the recipe—juice from the tomato and olive oil—together soften the crunchy bread just the right amount if eaten immediately after serving. None of our pieces lasted long enough to get soggy. You could do so many things with this bruschetta—topping it with a lovely piece of fish, adding it to a sandwich, or adding cheese to the recipe, just to name a few ideas. It's so good you'll want to find more ways to enjoy this dish. The recipe feeds more than the 6 servings suggested. My tomatoes prior to cutting (and these were not huge tomatoes, all 4 just medium) weighed in at 2 pounds. My loaf of ciabatta rendered 17 slices, cut on the bias. You may want to get a second loaf if you plan to serve all the topping as each piece took about 1 1/2 tablespoons, being liberal with the topping. You certainly could add more topping as this is the star of the dish but it gets a little messier to eat the more topping you add. Such an easy and outstanding dish. We will make this often.